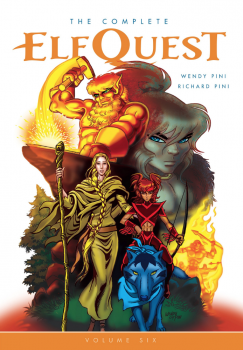 Dark Horse Comics has announced the sixth collection in the Complete ElfQuest omnibus series which chronicles the core canonical stories of the series. This edition collects over 500 pages of deep looks into Wolfrider backstories and essential events. Discover how humans, looking to escape their own barren lands, invade Bearclaw’s forest and cause unseen disaster for the elves. Also included are stories showcasing the deep bond of brotherhood between Cutter and Skywise. Whether hatching a plan to steal treasure from the Troll King, or dealing with magical madness that reverts one of them to feral wolf-mind, adventure is never far away from these two! The book is slated for release in summer 2019. More details here.